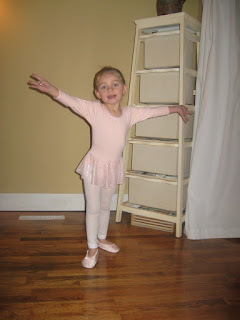 Keeping Up With the Kapenga's: Our Little Ballerina! Jenna has been signed up to take a dance class for a few months now but I finally told her last week since I new the excitement level would be very high and she would be asking when she could go all the time. As soon as I told her we had to review the days of the week so she knew exactly how long it would be until Tuesday would arrive. 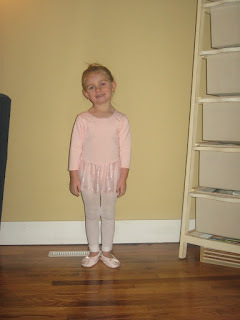 Each night when she'd go to bed she'd ask "is tomorrow the day I get to go to dance class?" Finally on Monday night the answer was yes, but that meant all day Tuesday she wondered when we could leave. Finally after lunch I let her put her dance clothes on and she prance around the house in them for almost 2 hours before we left for her afternoon class. The class is through Zeeland Rec Department and is held at the new rec building. We were in the waiting area and she got her ballet slippers on and was all excited....then the doors to the dance studio opened. We walked in with all the other little girls and their parents but then she suddenly stopped, grabbed my leg and begged me to stay. I wasn't allowed to and didn't really want to, as mean as it sounds I want her to be able to do this stuff without so much fear. All the little girls were in a circle with the teacher saying their names and favorite ice cream flavor while I was crouched next to Jenna trying to convince her to try it while I stayed right outside the door. I tried to tell her how much fun she'd have and how cool is would be to learn to dance and that I would be back in only a few minutes. Her little eyes looked so sad (which made me feel even worse pushing her to do this) and at one point she looked at me with quivering little lips and said "we can leave and just bring back my dance clothes to Target, I don't want to stay." It was breaking my heart but I knew she would love this. I asked her if I could walk her over to the circle by the teacher and then go watch her from the door and if she did we would stop for her favorite treat, cookie at Zeeland Bakery, on the way home. Needless to say it worked. She never once looked towards the window in the door and after class came running out saying "mommy I love dancing, I had so much fun". On the way to the bakery from the back seat she said "mommy, next time I will give you a hug and you can tell me good-bye, have fun and then I will go right in without any crying".....sounds good to me! That is so cute and so Jenna! I can't believe how fast she is growing up... Before you know it she will be off to school! Adorable! I still have my pink ballet slippers...they're pretty old by now! Haha. I can so see Jenna doing that! How funny.